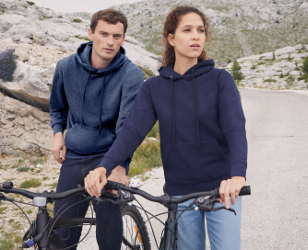 Established in 1851, Fruit is one of the world's largest clothing manufacturers and has a wide range of t-shirts, polos, sweats and hoodies, all designed with high quality yarns to give the perfect base for print or embroidery. 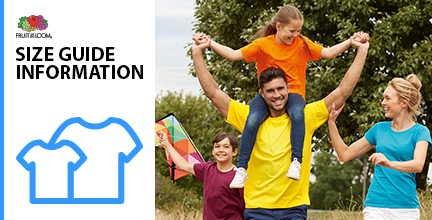 Has led the way in garment manufacturing for over 160 years and this hard-earned expertise is just one of the reasons why it's our best-selling brand for t-shirt printing, embroidered polo shirts and personalised hoodies. All garments are ethically produced, are manufactured in WRAP approved facilities and conform to Oeko Tex Standard 100. Sizes vary by manufacturer, so it's important to check you are buying the right sizes for you and your team. Fruit offer strong size consistency across their range and are generally considered a standard fit. Most products made by Fruit come in a mens, ladies and childrens version so you can ensure you get an appropriate fit. Every product on our site has full size information available so please check the measurements on any individual item before you decide it's the right product for you. Fruit of The Loom have always been well known for offering a wide choice of colours within their product range. 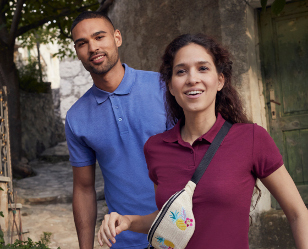 Today, they have more colours within their collections than ever before which makes it easy to match a Fruit of The Loom product with your customisation.